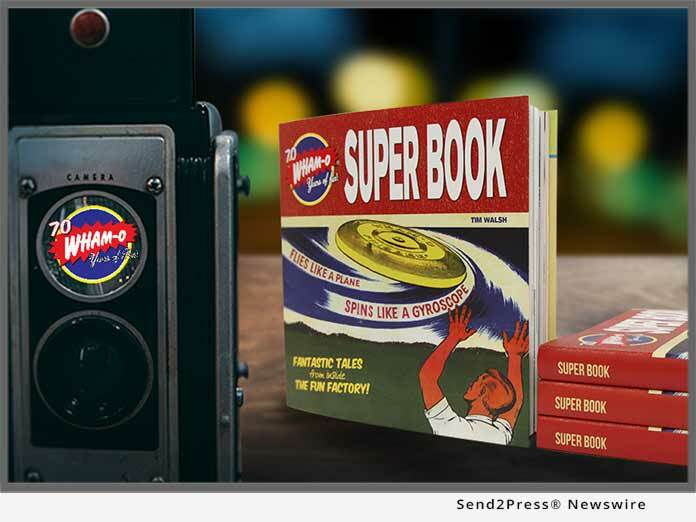 Wham-O, the iconic all-American recreational toy brand, will release a new commemorative book marking the 70th anniversary of the company. The book, entitled “SUPER BOOK – Fantastic Tales From Inside The Fun Factory” (ISBN: 978-0692163054), takes readers on a journey through the innovation and imagination that led to the creation of some of the world’s most inventive, beloved toys and games that every family has played with for the last 70 years. CARSON, Calif. /California Newswire/ — Wham-O, the iconic all-American recreational toy brand, will release a new commemorative book marking the 70th anniversary of the company. The book, entitled “SUPER BOOK – Fantastic Tales From Inside The Fun Factory” (ISBN: 978-0692163054), takes readers on a journey through the innovation and imagination that led to the creation of some of the world’s most inventive, beloved toys and games that every family has played with for the last 70 years. Wham-O was co-founded by Richard Knerr and his boyhood best friend Arthur “Spud” Melin. After humble beginnings in a Southern California garage in 1948, the toy manufacturer repeatedly captured lightning in a bottle with its creative and innovative products. Wham-O gave the world the Hula Hoop and the Frisbee. The company later rolled out the Slip ‘N Slide, the Superball, the Trac-Ball, Silly String, the Hacky Sack, the Boogie Board and many more. Wham-O is releasing the book as part of the company’s 70th anniversary celebration. Filled with color photos of toys through the years and other historical information, this book is the perfect companion for toy lovers, young and old, and all who appreciate the interesting stories behind every toy and game families have been playing with for the last three generations. With 70 years of cultural and commercial significance, and with a lineup of consumer products that appeal to people of all ages, the Wham-O brand remains synonymous with fun, play and sport. They manufacture and market some of the most recognizable consumer brands in the world today, from classics like Frisbee discs, Slip ‘N Slide water slides, and Hula Hoop toy hoops, to outdoor brands like Morey, Boogie body boards, Snow Boogie sleds, and BZ Pro Boards. Wham-O is a company and lifestyle brand that is steeped in the American cultural tradition of classic, well made toys. They continue their success and entrepreneurial spirit by building smart partnerships, targeting partners aligned with their mission of bringing new products to market that promote an ongoing commitment to the highest-quality, and to bringing families, friends, and teammates together during every season of the year – indoors and out. Their memorable motto, “Go out and Play” is one tagline that has resonated with every family in the world for generations in the past, present, and future. For more information, please visit https://wham-o.com/ and follow @WhamOOfficial on LinkedIn, Facebook and Instagram for company updates and initiatives and to subscribe to the latest news on the company’s world-class brands.